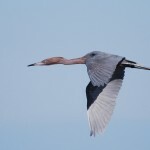 Held on the third Saturday of each month, Birding 201 always seems to bring to light the natural beauty of Galveston. The recent Birding 201 trip was no exception, introducing the six participants we had to a great variety of wild birds. The weather cooperated for this Saturday event. 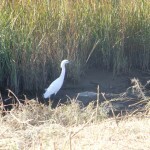 We visited Galveston’s 51st Street viaduct marsh and noted a few early waterfowl and some herons/egrets. We then crossed over to Pelican Island to visit the TAMUG wetlands area. The highlight here was a pair of scissortail flycatchers perched on the fence, making for some good photo opportunities before we even got out of the van. Some good looks at black crowned night herons and red-winged blackbirds before we headed east to the Pier 19 dock area, then onto the Corps Woods near the Ferry Landing. A few smaller birds were there, but not a major hotspot. We drove east down Seawall Boulevard to the very end, then south through Big Reef and onto east beach. We completed the loop around Condo Road back to Seawall. This section of the trip offered the best diversity of species and great behavioral observations of marsh and shore birds as well as a couple pairs of northern Harriers hunting as teams. By my count, we saw all of 49 species on the trip. In taxonomic order, we saw: Pied-billed Grebe, Brown Pelican, Neotropic Cormorant, Double-crested Cormorant, Great Blue Heron, Great Egret, Snowy Egret, Tricolored Heron, Cattle Egret, Black-crowned Night Heron, White Ibis, Roseate Spoonbill, Osprey, Northern Harrier, Broad-winged Hawk, Clapper Rail, American Coot, Black-bellied Plover, Killdeer, Black-necked Stilt, Greater Yellowlegs, Willet, Marbled Godwit, Ruddy Turnstone, Semipalmated Sandpiper, Western Sandpiper, Short-billed Dowitcher, Laughing Gull, Ring-billed Gull, Herring Gull, Caspian Tern, Royal Tern, Black Skimmer, Rock Pigeon, Eurasian Collared Dove, Mourning Dove, Common Nighthawk, Belted Kingfisher, Downy Woodpecker, Eastern Phoebe, Scissor-tail Flycatcher, Loggerhead Shrike, Cliff Swallow, Northern Mockingbird, European Starling, Red-winged Blackbird, Eastern Meadowlark, Great-tailed Grackle, and House Sparrow. Since the trip, I’ve noted a big influx of migratory species showing up. 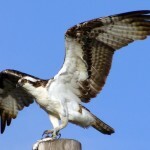 Osprey’s have moved in with good numbers, Sandhill Cranes and White pelicans have started to show up, some waterfowl arriving. Someone also pointed out a Quaker’s Parrot nest on Avenue S just west of 53rd Street on the south side (adjacent to the old police station). I drove by slowly yesterday and there were several parrots noisily eating the palm fruit in the adjacent tree. Now is a good time to check out the bird population on the island. Get out and enjoy them while they’re here. Greg Whittaker is Moody Gardens animal husbandry manager and, as a birding enthusiast, frequently leads free Birding 101 on the first Saturday and Birding 201 on the third Saturdays of each month.